Everyone has an opinion on tonight’s intriguing Charles Martin-Anthony Joshua fight. A genuine 50-50 affair in the opinion of many – including A.J’s promoter Eddie Hearn – the IBF title fight will set the winner up for some huge fights. One of these potential blockbusters awaiting tonight’s winner is a unification clash with unbeaten KO King Deontay Wilder, the reigning WBC champion. 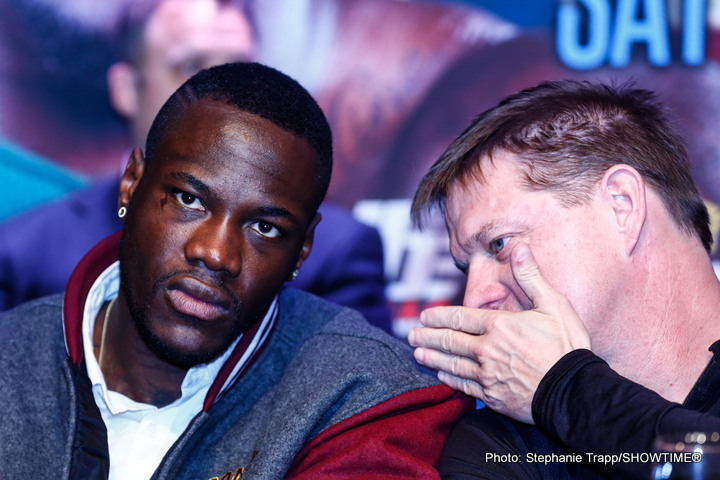 Wilder, of course, has to take care of the formidable Alexander Povetkin in Russia first, but as long as he takes care of business, Wilder would be willing to defend his belt, and look to pick up another title, against either Martin or Joshua. Speaking with Wilder’s trainer Jay Deas earlier today, I was informed how a Wilder-Martin fight is a distinct possibility if “Prince” Charles can bag himself the win tonight. “[It’s an] interesting fight,” Deas said of tonight’s title fight. “Joshua has much more of an extensive amateur background at the highest level, and that can play a part – as it did when Lennox Lewis beat Michael Grant (inside 2 rounds back in 2000). Martin, though, has the belt, and when you have the belt life is better. It’s a life you don’t want to let go of. Confidence is also higher with a title; this is why they say winning a world title makes you 25-percent better. Martin is a big, strong southpaw. We know his team well and they are a hardworking, determined group. The current heavyweight scene is indeed exciting. As for a possible Wilder-Martin fight, I think Wilder would have way too much power, speed and aggression for the current IBF champ, but the fight would definitely prove attractive, especially if Martin can do a number on Joshua tonight. But, as Deas says, the UK will have a great bunch of heavyweights at the top if Joshua can do it tonight. But which fighter out of Joshua, Haye and Fury has the best shot at defeating Wilder? There are so many potentially great fights out there for the future. The fun starts, we hope, with tonight’s rumble. Prediction: Joshua to take Martin out inside 4-rounds in a short and sweet thriller.